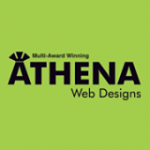 Athena Web Designs provide organisations and businesses throughout the UK with a complete marketing solution. Their client base consists of both start-ups and established enterprises that are looking to create, refresh or rebuild their brand. Their passion and expertise goes beyond their specialist web design and development skills as they also offer search engine optimisation (SEO), email marketing, logo design and business stationery.